I have been struggling lately about what to blog about....Do I share about things that happen at school even though we are CONSTANTLY reminded about being careful what we say on Facebook and blogs (and my blog is no secret!)? Do I share about how sad my heart has felt lately watching people I love having declining health problems that seem to take a little of their life everyday and have me wondering how much time they have left? Do I share about how I am still insecure about my blog and sharing activities because I wonder if they are good enough? What if the trials of this life are Your mercies in disguise﻿. I also have needed lately to revisit some of the poems I wrote. It is so easy to get overwhelmed by curriculum pressures, behavior problems, grades, assessments, grown-ups who don't act like grown-ups, and a million other things that seem to keep us from remembering why we teach. We have the most amazing opportunity to teach our children to be patient, understanding, helpful, encouraging, and so much more and that one day they will make a difference. 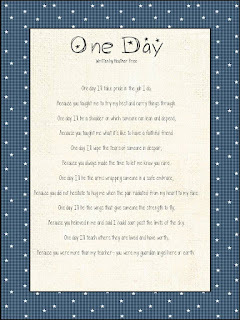 Please take a moment to read this poem and think about the kiddos in your room. Please go check out my giveaway! You could win one of these adorable shirts and some other wonderful items! Go hop over here! I would LOVE for you to blog about my giveaway! If you blog about it several times, I have a special little present for you! Please leave me a heart note if you grab this activity. Your heart notes always make my heart smile! Thanks for the reminder about how very blessed we are. My pastor last weekend said, "Instead of focusing on what God is not doing, focus on what He is doing." Amen. Thanks so much for the freebie! Super cute! I really want to win a shirt! I never win another though. Maybe my luck will change with your giveaway. I love the love monsters. I bet your kids do too! Thanks for sharing! Have a great Saturday evening! Don't we all feel like this sometimes! You have a great blog with great ideas and your heart and love for teaching always shines through in your posts! Thanks for the freebie! What a wonderful freebie - thanks for sharing it! I love your blog... I cant believe you doubt yourself. I have been blogging for two months and have no clue what I'm doing. Your blog is the one I turn to for guidance. For the what is it "supposed to be like" inspiration. I want to hear whats going on at school, whats going on with the difficult personal stuff (because we all have that, or at least, I do too! ), and I want freebies and contests. So the mix is perfect-o!!! Sometimes there's just nothing to blog about...that's okay, doesn't make you any less of a person, teacher or blogger. Makes you human though. Other people's trials become our own to a degree...and that makes it hard to find peace. Many hugs of thanks to you for making me a better teacher! Oh my goodness, thank you for sharing the poem One Day. I love it. It is exactly what I needed this week. You are wonderful! I know we get that feeling sometimes, but I love everything you have shared. I admire all your poems! So inspiring! It always seems like your classroom is so engaging and a great place to learn. Thank you! 1) Thanks for the reminder on how blessed we truly are. I know that sometimes I forget what I have---just waking up and being able to enjoy my family another day longer is a HUGE blessing. 2) Honeychild, you're things are AWESOME. Seeing the things you post (and for free) well, there's another blessing! 3)This center/workstation is PERFECT for where we are in math right now. Thank you so much. Are you kidding me?? your blog is DEFINITELY "good enough"! I look forward to it whenever I see you have a new post! And I LOVE Laura Story!! BIG <3 here!! Everything you make is great and its amazing how many activities you give away. Very generous! I agree with everyone else. You are amazing! I think we are all too hard on ourselves. Myself included. Do not worry about what others are thinking or saying. Just be yourself and enjoy every minute. I LOVE LOVE LOVE that song - I get choked up every time I hear it. While I read the lyrics on your blog, I was singing them in my head. As you know, I blog about whatever I need to talk about at the time. So far, no followers have left me so I say just be yourself! Thanks for the math freebie! I love that song! It def. helps when I'm feeling overwhelmed and anxious (two things I struggle with). I love the freebie! I'm going to use it with some of my more advanced kiddos . Thanks for your "Food for Thought" and freebie. Love your activities. 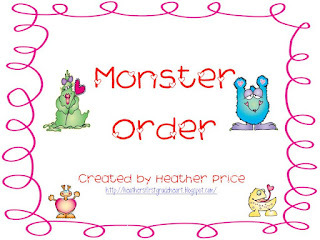 I can see why your kiddos love the monsters - so cute! I was touched by your poem. I hope you don't mind that I saved it for display. Blogged about this on my blog and on my Facebook page. Thank you so much for sharing with my students. I can really relate to your post today. I find myself asking the same questions, having the same concerns. I'm a much newer blogger and frequently have doubts. It's so true that we can easily get distracted by the extraneous concerns that seem to take us away from our number one responsibility, our students. Thank you for helping me to refocus. But, your blog is fabulous, and well worth reading. Thank you for sharing so much of what you do! 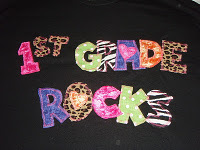 Thanks for the freebies- I'm following your blog and TPT store. How fun --Monster Number Order! LOVE! Thanks for sharing!! I love your blog and the freebies. Thank you for stopping by my blog: The 3AM Teacher. I love your design! I think we all, at some point, have contemplated what to share. I think you may need to read, "What If's" by Shel Sylverstein (LOL) I would write it on my comment, but what if I get into myself into "copyright" trouble (hehehe). You can rest assure that your stuff is awesome. Have a great Sunday & I am officially following your heart-filled blog! I love reading your posts! We are so very blessed!! Thanks for the freebie!!! Love it! Your poem and its message is so beautifully written. Thank you so much for sharing it! WE all feel like that sometimes. Thanks for sharing it! I love the Monsters super cute. Your ideas are so awesome and the fact that you are so willing to share is a blessing to not only us teachers, but the children you touch with your activities. Thank you for sharing your poem, that's very brave!! And thank you for the freebie! My little friends could always use the extra help! :) ~Heidi V.
Thank you for this message of encouragement... It was a blessing and just what I needed after a day of benchmarking and some unexpected news. Thank you for sharing your beautiful poem! I love all the activities you share. Thanks for reminding us that we are blessed! Thanks for sharing your Monster Order freebie! Thanks for sharing this fun activity. I love that song about blessings too. One of the youth at church sings it and it's so beautiful. I have those insecure feelings a lot too. I wasn't sure about posting activities that I've made and even more insecure about trying to sell things. I think the winter blahs are starting to get to a lot of us. I love your blog. Blessings is one of my favorite songs too. Your blog show a unique balance that is needed to teach. Thanks for your words and freebies!